1079. Lee C FRANK 1, 2 (Sarah Charlotte LOONEY , Luisa Ann BITLER , Daniel , John , Johannes ) was born on 30 Sep 1867 in Troy, Miami Co, OH. He died before Apr 1976. Lee resided in 1880 in Troy, Miami Co, OH. He resided in 1900 in South "B" St, Gas City, Grant Co, IN. He worked as Furniture Work in 1900. He resided in 1910 in 219 South St, Gas City, Grant Co, IN. He worked as Undertaker - Own Office in 1910. He resided in 1920 in E Main St, Gas City, Grant Co, IN. He worked as Undertaker in 1920. He resided in 1930 in 334 E Main St, Gas City, Grant Co, IN. He worked as Undertaker in 1930. Lee married Belle W on 5 Jun 1895 in Grant Co, IN. Belle was born in Apr 1879 in OH. She died in 1920/1930 in IN. Belle resided in 1900 in South "B" St, Gas City, Grant Co, IN. She resided in 1910 in 219 South St, Gas City, Grant Co, IN. She resided in 1920 in E Main St, Gas City, Grant Co, IN. Margery FRANK was born in Aug 1898 in IN. Margery resided in 1900 in South "B" St, Gas City, Grant Co, IN. She resided in 1910 in 219 South St, Gas City, Grant Co, IN. She resided in 1920 in E Main St, Gas City, Grant Co, IN. She worked as Stenographer in 1920. Richard FRANK was born about 1903 in IN. Richard resided in 1910 in 219 South St, Gas City, Grant Co, IN. He resided in 1920 in E Main St, Gas City, Grant Co, IN. Dorothy FRANK was born about 1905 in IN. Dorothy resided in 1910 in 219 South St, Gas City, Grant Co, IN. She resided in 1920 in E Main St, Gas City, Grant Co, IN. She resided in 1930 in 334 E Main St, Gas City, Grant Co, IN. She worked as Stenographer - Glass Works in 1930. Dorothy married Brinley W LEANO. William C FRANK was born about 1907 in IN. William resided in 1910 in 219 South St, Gas City, Grant Co, IN. He resided in 1920 in E Main St, Gas City, Grant Co, IN. He resided in 1930 in 334 E Main St, Gas City, Grant Co, IN. He worked as Chauffeur - ?ran?rs in 1930. 3402 M v Robert FRANK. 1080. Mabel L FRANK [scrapbook] 1, 2 (Sarah Charlotte LOONEY , Luisa Ann BITLER , Daniel , John , Johannes ) was born on 5 Aug 1869 in Piqua, Miami Co, OH. She died on 25 Mar 1938 in Miami Co, OH. She was buried on 28 Mar 1938 in Riverside Cemetery, Troy, Miami Co, OH. Mabel resided in 1880 in Troy, Miami Co, OH. She resided in 1910 in 402 Lincoln Ave, Troy, Miami Co, OH. She resided in 1920 in 402 Lincoln Ave, Troy, Miami Co, OH. She worked as Housewife in 1938. Mabel married John Harlan SCOTT [scrapbook] 1, son of James SCOTT and Francis SPROUL, on 1 Jun 1892 in Miami Co, OH. 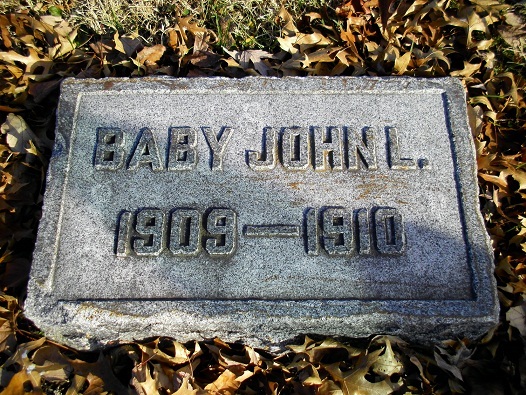 John was born on 17 Apr 1866 in Miami Co, OH. He died on 27 Dec 1950 in Dayton, Montgomery Co, OH. He was buried on 29 Dec 1950 in Riverside Cemetery, Troy, Miami Co, OH. John resided in 1910 in 402 Lincoln Ave, Troy, Miami Co, OH. He worked as Mail Clerk - Railway in 1910. He resided in 1920 in 402 Lincoln Ave, Troy, Miami Co, OH. He worked as RR Clerk - Mail in 1920. He resided in Dec 1950 in 402 Lincoln Ave, Troy, Miami Co, OH. He worked as Railroad Mail Clerk with U.S. Government in Dec 1950. + 3403 F i Mildred Marie SCOTT was born on 3 Nov 1892. + 3404 M ii Lee Warren SCOTT was born on 23 Aug 1895. He died on 28 Mar 1976. + 3405 M iii Harlan Coleman SCOTT was born on 21 Apr 1900. He died on 26 Mar 1972. James Franklin SCOTT [scrapbook] was born on 18 Jan 1903 in Miami Co, OH. 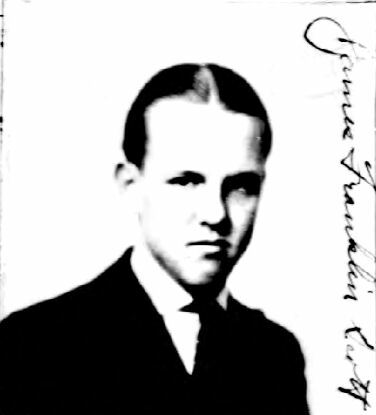 James resided in 1920 in 402 Lincoln Ave, Troy, Miami Co, OH. He resided in Jun 1924 in 402 Lincoln Highway, Miami Co, OH. He worked with Troy Sunshade Company. James married Francis RUSH on 27 Nov 1953. 1081. Edith Maud "Maud" FRANK [scrapbook] 1, 2 (Sarah Charlotte LOONEY , Luisa Ann BITLER , Daniel , John , Johannes ) was born on 27 Jan 1877 in Troy, Miami Co, OH. She died on 19 Aug 1976 in Stouder Memorial Hospital, Troy, Miami Co, OH. 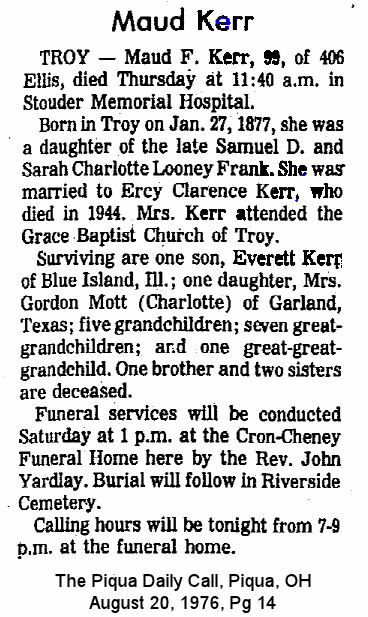 She was buried on 21 Aug 1976 in Riverside Cemetery, Troy, Miami Co, OH. Maud resided in 1900 in Main St, Troy, Miami Co, OH. She resided in 1920 in 6 Park Ave, Lebanon, Warren Co, OH. She resided in 1930 in Columbus, Franklin Co, OH. She was a member of Grace Baptist Church in Troy, OH. She resided in Apr 1976 in 406 Ellis, Troy, Miami Co, OH. Maud married Ercy Clarence KERR 1, son of William Rufus KERR and Delilah PEIRCE, on 26 Dec 1900 in Troy, Miami Co, OH. Ercy was born on 8 Mar 1877 in OH. He died on 28 Feb 1944 in Chicago Heights, Cook Co, IL. Ercy resided in 1900 in Earlham College, Wayne Twp, Wayne Co, IN. He worked as Student Teacher in 1900. He resided in 1920 in 6 Park Ave, Lebanon, Warren Co, OH. He worked as Teacher - School in 1920. He resided in 1930 in Columbus, Franklin Co, OH. He worked as Bible Salesman in 1930. + 3407 M i Everett Frank KERR was born on 29 Apr 1905. He died on 22 Jan 1994. + 3408 F ii Charlotte D KERR was born on 9 Mar 1908. She died on 2 Sep 1991. 1083. 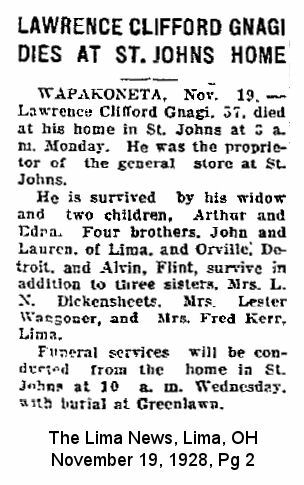 Lawrence Clifford "Cliff" GNAGI [scrapbook] 1, 2 (Hannah LOONEY , Luisa Ann BITLER , Daniel , John , Johannes ) was born on 3 Aug 1871 in Clay Twp, Auglaize Co, OH. He died on 19 Nov 1928 in St Johns, Clay Twp, Auglaize Co, OH. He was buried on 21 Nov 1928 in Greenlawn Cemetery, Wapakoneta, Auglaize Co, OH. Cliff resided in 1880 in St John, Auglaize Co, OH. He resided in 1900 in Clay Twp, Auglaize Co, OH. He worked as Salesman - Groceries in 1900. He resided in 1910 in Clay Twp, Auglaize Co, OH. He worked as Groceryman - Own Grocery in 1910. He resided in 1920 in Clay Twp, Auglaize Co, OH. He worked as Retail Merchant - General Store in 1920. He resided in Nov 1928 in St John, Auglaize Co, OH. He worked as Merchant in Nov 1928. Cliff married Gertrude Ann COWELL [scrapbook] 1, 2, daughter of Edwin COWELL and Mary, about 1896 in Auglaize Co, OH?. 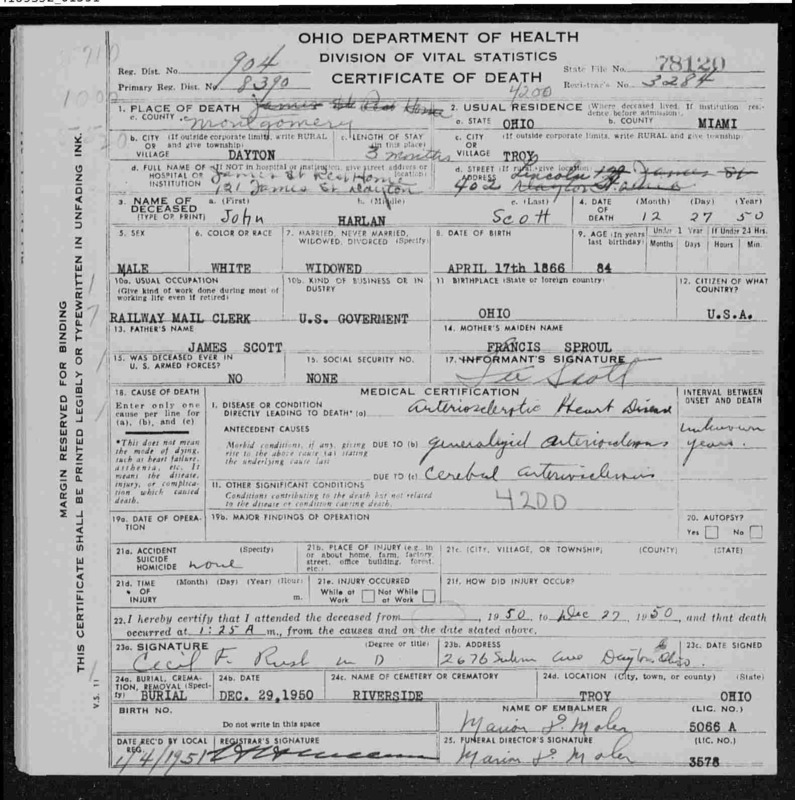 Gertrude was born in Feb 1875 in OH. 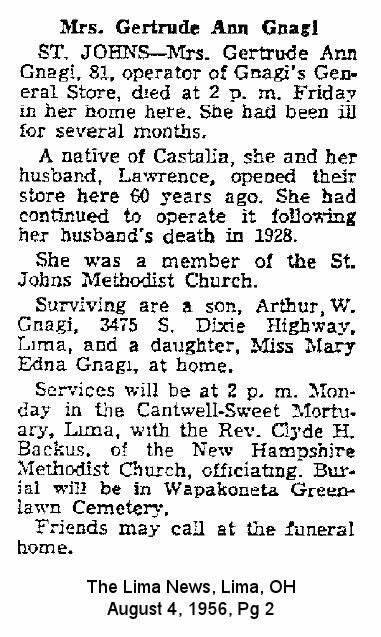 She died on 3 Aug 1956 in St Johns, Clay Twp, Auglaize Co, OH. She was buried on 6 Aug 1956 in Greenlawn Cemetery, Wapakoneta, Auglaize Co, OH. Gertrude resided in 1880 in Harrison Twp, Paulding Co, OH. She resided in 1900 in Clay Twp, Auglaize Co, OH. She resided in 1910 in Clay Twp, Auglaize Co, OH. She resided in 1920 in Clay Twp, Auglaize Co, OH. She worked as Grocer Store Operator from 1928 to 1956. She was a member of Methodist Church in St Johns, Auglaize Co, OH. She resided in Aug 1956 in St Johns, Clay Twp, Auglaize Co, OH. Mary Edna GNAGI 1 was born on 29 May 1899 in OH. She died on 14 Jul 1972. Mary resided in 1900 in Clay Twp, Auglaize Co, OH. She resided in 1910 in Clay Twp, Auglaize Co, OH. She resided in 1920 in Clay Twp, Auglaize Co, OH. She was issued a social security number before 1951 in OH. She resided in Aug 1956 in St Johns, Clay Twp, Auglaize Co, OH. She resided in Jul 1972 in St Johns, Clay Twp, Auglaize Co, OH. Arthur W GNAGI 1, 2 was born on 22 Aug 1903 in OH. He died on 23 Oct 1985 in Lima Memorial Hospital, Lima, Allen Co, OH. He was buried in Greenlawn Cemetery, Wapakoneta, Auglaize Co, OH. Arthur resided in 1910 in Clay Twp, Auglaize Co, OH. He resided in 1920 in Clay Twp, Auglaize Co, OH. He was issued a social security number before 1951 in OH. He resided in Aug 1956 in 3475 S Dixie Highway, Lima, Allen Co, OH. He resided in Oct 1985 in Lima, Allen Co, OH. He worked as Proprietor - Real Estate Company. 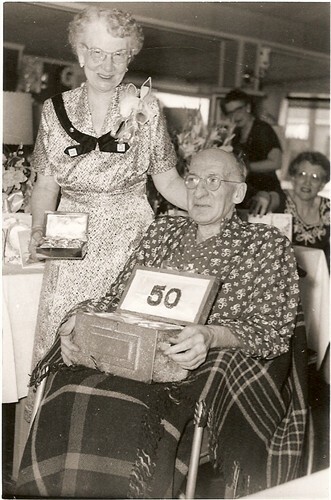 Arthur married Lila Marie WIEBE 1, daughter of William WIEBE and Elizabeth HAUCK, on 7 Jun 1954. Lila was born on 18 Jul 1907 in Beatrice, NE. She died on 6 May 1990 in Allen Co, OH. Lila was issued a social security number before 1951 in OH. She worked as school teacher. 1085. Guy Marvin JAMES [scrapbook] 1 (Alice Martha LOONEY , Luisa Ann BITLER , Daniel , John , Johannes ) was born on 16 Feb 1881 in Troy, Miami Co, OH. He died on 10 Apr 1958 in Wickliffe, Lake Co, OH. He was buried in Whitehaven Cemetery, Mayfield Heights, Cuyahoga Co, OH. Guy resided in 1885 in El Paso Co, CO. He served in the military with Spanish-American War. He resided in 1910 in Cleveland, Cuyahoga Co, OH. He resided in 1920 in Cleveland, Cuyahoga Co, OH. He worked as Decorator in 1920. He resided in 1930 in Cleveland, Cuyahoga Co, OH. He worked as Self-employed painter and decorator. He was issued a social security number . Guy married 1 Nettie Murle EDDY [scrapbook] 1, daughter of Hazael Parker EDDY and Jennie I WITTER, on 8 Apr 1904 in Lake Co, OH. Nettie was born on 3 Sep 1884 in Cleveland, Cuyahoga Co, OH. She died on 5 Mar 1971 in Painesville, Lake Co, OH. She was buried in Whitehaven Cemetery, Mayfield Heights, Cuyahoga Co, OH. Nettie resided in 1900 in Willoughby, Lake Co, OH. She resided in 1910 in Cleveland, Cuyahoga Co, OH. She resided in 1920 in Willoughby, Lake Co, OH. She resided in 1920 in Cleveland, Lake Co, OH. She resided in 1930 in Cleveland, Lake Co, OH. + 3411 F i Hazel Alice JAMES was born on 21 Feb 1906. She died on 20 Jun 2004. + 3412 F ii Viola Harriet JAMES was born on 20 Apr 1908. She died on 4 Jan 1942. + 3413 F iii Dorothy May JAMES was born on 9 May 1910. She died on 30 Mar 1996. 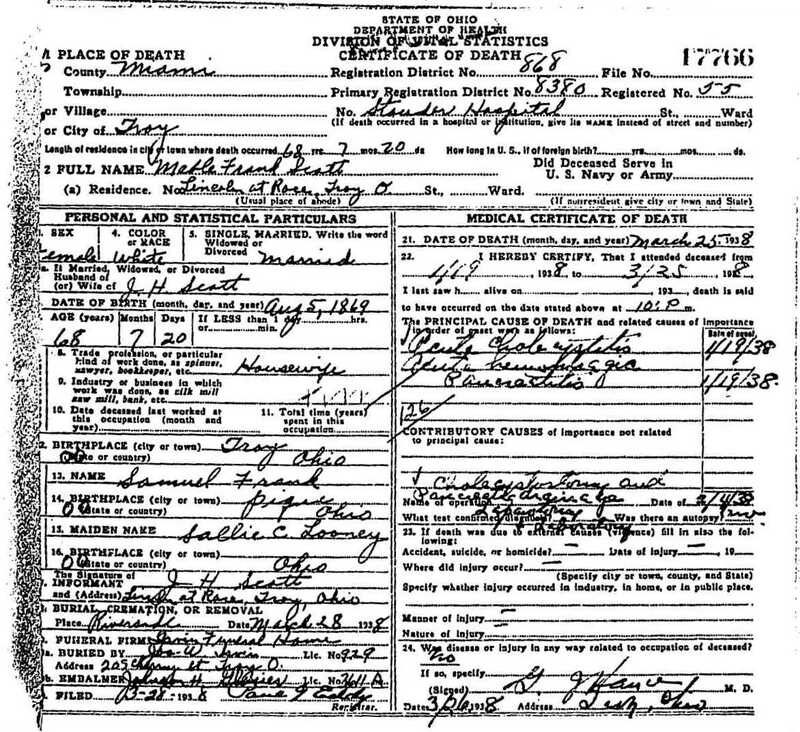 + 3414 M iv Marvin Guy JAMES was born on 9 Mar 1914. He died on 7 Jun 1983. 3415 F v Jennett Marian JAMES. 3416 M vi William Eddy JAMES. 1086. Raymond A JOSLIN [scrapbook] (Alice Martha LOONEY , Luisa Ann BITLER , Daniel , John , Johannes ) was born on 30 Jun 1891 in Pittsburgh, Allegheny Co, PA. He died on 23 Aug 1978 in Lee Co, FL. Raymond resided in 1900 in 49 Cory Ave, Cleveland, Cuyahoga Co, OH. He resided in 1910 in 84 Auburndale Rd, East Cleveland, Cuyahoga Co, OH. He served in the military with in WW I. He resided in 1920 in 14400 Strathmore Ave, East Cleveland, Cuyahoga Co, OH. He worked as Cost Clerk - Millard Bank? in 1920. He resided in 1930 in 15309 McKinley Ave, Cleveland, Cuyahoga Co, OH. He worked as Clerk - Post Office in 1930. 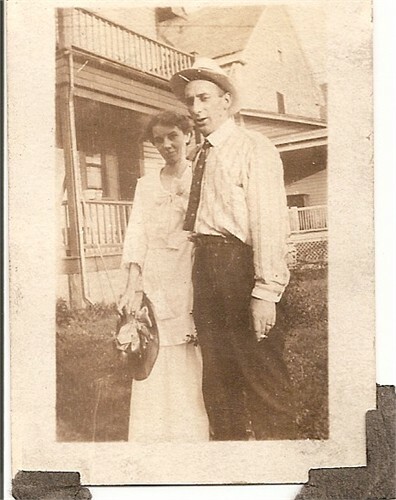 Raymond married Nellie M about 1922 in OH. Nellie was born in 1894 in OH. She died on 4 Oct 1958 in Cleveland Clinic Hospital, Cleveland, Cuyahoga Co, OH. Nellie resided in 1930 in 15309 McKinley Ave, Cleveland, Cuyahoga Co, OH. 3417 F i Dorothy I JOSLIN. 1087. Sarah Estelle BITLER 1, 2 (Sylvester VanTress , Daniel , Daniel , John , Johannes ) was born on 29 Jul 1861 in Wapakoneta, Auglaize Co, OH. She died on 12 Jul 1939 in Mendota, LaSalle Co, IL. She was buried in Restland Cemetery, Mendota, LaSalle Co, IL. Sarah resided in 1870 in Wapakoneta, Auglaize Co, OH. She resided in 1880 in Madison, Greenwood Co, KS. She worked as Teaching School in 1880. She resided in 1910 in Mendota, La Salle Co, IL. She resided in 1930 in 905 Fourth Ave, Mendota, LaSalle Co, IL. She worked as None in 1930. Sarah married Henry TOWER 1, 2, son of Justus David TOWER and Mary CAIRNS, on 23 Dec 1884 in Greenwood Co, KS. Henry was born on 2 Nov 1858 in Clarion Twp, Bureau Co, IL. He died on 8 Oct 1918 in Mendota, LaSalle Co, IL. Henry resided in 1880 in Cleveland, Cuyahoga Co, Ohio. He worked as Railroad Fireman in 1880. 3418 F i Faith TOWER. Infant Son TOWER 1 was born on 12 Nov 1885. He died on 15 Nov 1885. + 3420 M iii George E TOWER was born on 2 Jan 1887. He died on 18 Oct 1918. Mary Pearl TOWER 1 was born on 30 Jul 1888. + 3422 M v Forrest Lee TOWER was born on 25 Feb 1890. He died on 12 Nov 1945. + 3423 F vi Hope A TOWER was born on 29 Jan 1892. She died on 28 Oct 1918. + 3424 M vii Vere H TOWER was born on 26 Jun 1894. He died on 16 Oct 1918. + 3425 M viii Tracey Travers TOWER was born on 14 Oct 1896. He died on 17 Dec 1955. Infant Daughter TOWER 1 was born on 31 Jul 1901. She died on 16 Aug 1901. Infant Daughter TOWER 1 was born on 14 Mar 1905. She died on 14 Mar 1905. Henry Stanley TOWER 1 was born on 18 Feb 1907. He died on 15 Oct 1918 in Mendota, LaSalle Co, IL. Henry resided in 1910 in Mendota, La Salle Co, IL. Russell TOWER 1 was born on 11 Aug 1917. He died on 18 Mar 1948. 1088. 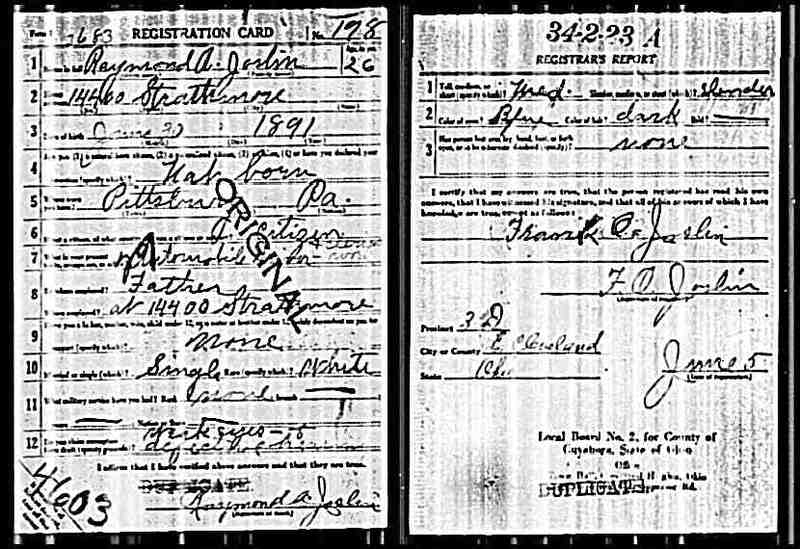 Lila Felle "Felle" BITLER 1 (Sylvester VanTress , Daniel , Daniel , John , Johannes ) was born on 20 Mar 1866 in Wapakoneta, Auglaize Co, OH. She died in 13 Jul 194?. Felle resided in 1870 in Wapakoneta, Auglaize Co, OH. She resided in 1880 in Madison, Greenwood Co, KS. She worked as At School in 1880. She resided in 1885 in Janesville, Greenwood Co, KS. She resided in 1900 in 1305 Merchants St, Emporia, Lyon Co, KS. She resided in 1920 in 1318 Neosho St, Emporia, Lyon Co, KS. She worked as Financial Secretary - ????? Order in 1920. She resided in 1930 in 1318 Neosho St, Emporia, Lyon Co, KS. She worked as Financier - Insurance Co in 1930. Felle married Edwin Augustus LEONARD 1 on 30 May 1888 in Lyon Co, KS. 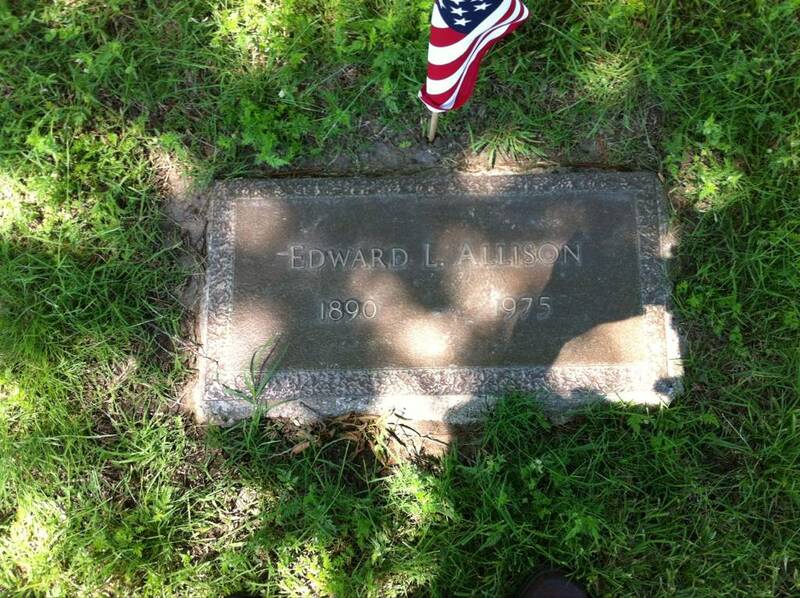 Edwin was born on 22 Mar 1865 in MN / WI. He died on 11 Jun 1919. Edwin resided in 1900 in 1305 Merchants St, Emporia, Lyon Co, KS. He worked as Undertaker in 1900. He resided in 1895 in Emporia, Lyon Co, KS. He resided in 1910 in Emporia, Lyon Co, KS. He worked as Undertaker in 1910. + 3430 F i Lulu D LEONARD was born on 4 Sep 1889. She died on 26 Apr 1988. Harold LEONARD was born on 4 Oct 1891 in KS. He died on 18 May 1952. He was buried on 21 May 1952 in Mount Hope Cemetery, Independence, Montgomery Co, KS. Harold resided in 1900 in 1305 Merchants St, Emporia, Lyon Co, KS. He resided in 1895 in Emporia, Lyon Co, KS. He resided in 1910 in Emporia, Lyon Co, KS. He worked as Mail Clerk - Supermarket? in 1910. He resided in 1930 in Independence, Montgomery Co, KS. He worked as telegrapher - pipeline company in 1930. Harold married Zelma HOCKETT, daughter of Milton B HOCKETT and Anne S, about 1920. Zelma was born in 1890. She died in 1984. She was buried in Mount Hope Cemetery, Independence, Montgomery Co, KS. Zelma resided in 1930 in Independence, Montgomery Co, KS. 1090. Ica Belle BITLER [scrapbook] 1 (Sylvester VanTress , Daniel , Daniel , John , Johannes ) was born in Dec 1870 in OH. She died on 28 Nov 1943 in Miami, Ottawa Co, OK. She was buried on 30 Nov 1943 in GAR Cemetery, Miami, Ottawa Co, OK.
Ica resided in 1880 in Madison, Greenwood Co, KS. She worked as At School in 1880. She resided in 1885 in Janesville, Greenwood Co, KS. She resided in 1900 in 1705 Colorado Ave, Colorado Springs, El Paso Co, CO. She resided in 1908 in Miami, OK. She resided in 1910 in L Street, Miami, Ottawa Co, OK. She resided in 1920 in 229 F St NW, Miami, Ottawa Co, OK. She resided in 1930 in County Rd, Ottawa Twp, Ottawa Co, OK.
Ica married John Lincoln MINOR [scrapbook], son of Noah MINOR and Martha, on 16 Nov 1892. John was born in Dec 1860 in IL. He died in 1930 in Miami, Ottawa Co, OK. He was buried in GAR Cemetery, Miami, Ottawa Co, OK.
John resided in 1880 in Richmond Twp, Ray Co, MO. He resided in Emporia, KS. He resided in Olpe, KS. He worked as Teacher. He resided in Perkins, OK. He resided in Florida. He worked as Grocery Store and Citrus Farming. He resided in 1900 in 1705 Colorado Ave, Colorado Springs, El Paso Co, CO. He worked as Farmer in 1900. He resided in 1910 in L Street, Miami, Ottawa Co, OK. He worked as Retail Merchant - Grocery in 1910. He resided in 1920 in 229 F St NW, Miami, Ottawa Co, OK. He resided in 1930 in County Rd, Ottawa Twp, Ottawa Co, OK.
+ 3432 M i Nelson N MINOR was born on 30 Oct 1893. He died on 17 Oct 1972. Beryl Elizabeth MINOR [scrapbook] 1 was born on 8 Feb 1895 in OK. She died on 1 Jul 1989 in Tulsa, Tulsa Co, OK. She was buried in Sec 20 Lot 73 Sp 2, Memorial Park Cemetery, Tulsa, Tulsa Co, OK.
Beryl resided in 1900 in 1705 Colorado Ave, Colorado Springs, El Paso Co, CO. She resided in 1910 in L Street, Miami, Ottawa Co, OK. She resided in 1920 in S Denver St, Tulsa, Tulsa Co, OK. She worked as stenographer - oil company in 1920. 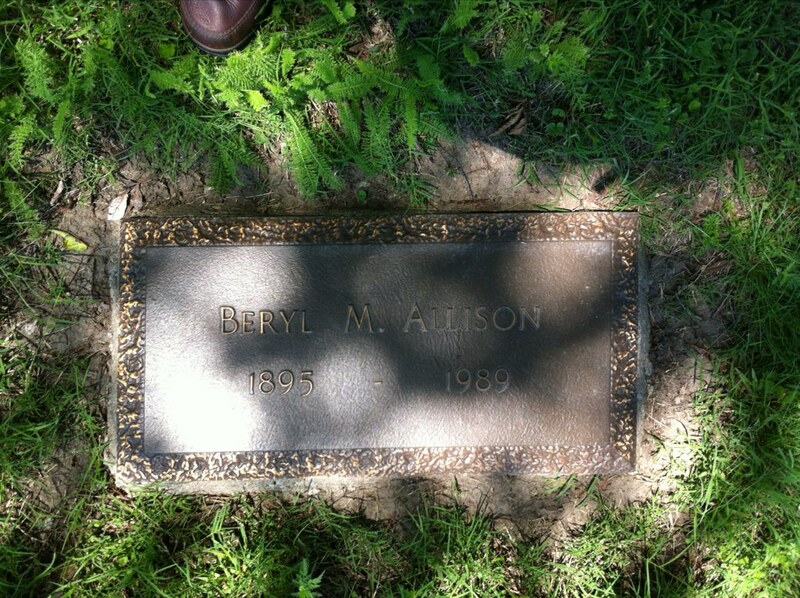 She resided in 1930 in 3125 S Madison, Tulsa, Tulsa Co, OK. She resided in 1940 in 1824 S Boulder Place, Tulsa, Tulsa Co, OK.
Beryl married Edward Lynn ALLISON [scrapbook] 1, son of James Rendleman ALLISON and Mary PITTMAN. Edward was born on 14 Jun 1890 in Rising Fawn, Dade Co, GA. He died in Sep 1975 in Tulsa, Tulsa Co, OK. He was buried in Sec 20 Lot 73 Sp 1, Memorial Park Cemetery, Tulsa, Tulsa Co, OK.
Edward resided in 1920 in S Denver St, Tulsa, Tulsa Co, OK. He worked as tracer - car in 1920. He resided in 1930 in 3125 S Madison, Tulsa, Tulsa Co, OK. He worked with life insurance co in 1930. He resided in 1940 in 1824 S Boulder Place, Tulsa, Tulsa Co, OK. He worked as insurance broker - insurance in 1940. + 3434 F iii Dorothy MINOR was born on 26 Jul 1900. She died on 18 Apr 1994. Myron Bitler MINOR [scrapbook] was born in 1902 in OK. He died in 1914. 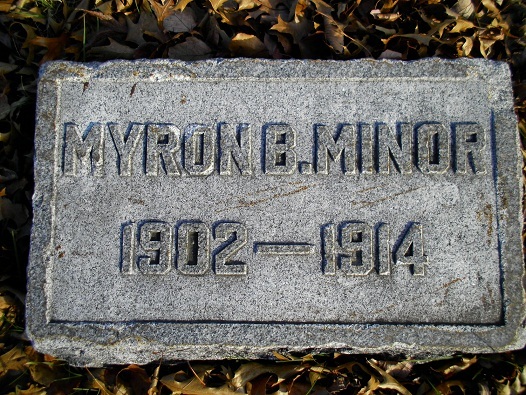 He was buried in GAR Cemetery, Miami, Ottawa Co, OK.
Myron resided in 1910 in L Street, Miami, Ottawa Co, OK.
Grace MINOR [scrapbook] 1, 2 was born on 24 Mar 1905 in Perry, Noble Co, OK. She died on 21 Sep 2000 in Woodburn, Marion Co, OR. Grace resided in 1910 in L Street, Miami, Ottawa Co, OK. She resided in 1920 in 229 F St NW, Miami, Ottawa Co, OK. She resided in 1935 in Tulsa, Tulsa Co, OK. She resided in 1940 in NW Irving St, Portland, Multnomah Co, OR. She worked as stenographer - bank in 1940. She resided in Nov 1943 in Portland, Multnomah Co, OR. She resided in 1966 in H2675 Fletcher Pkwy (El Cajon) Apt 320, San Diego, San Diego Co, CA. 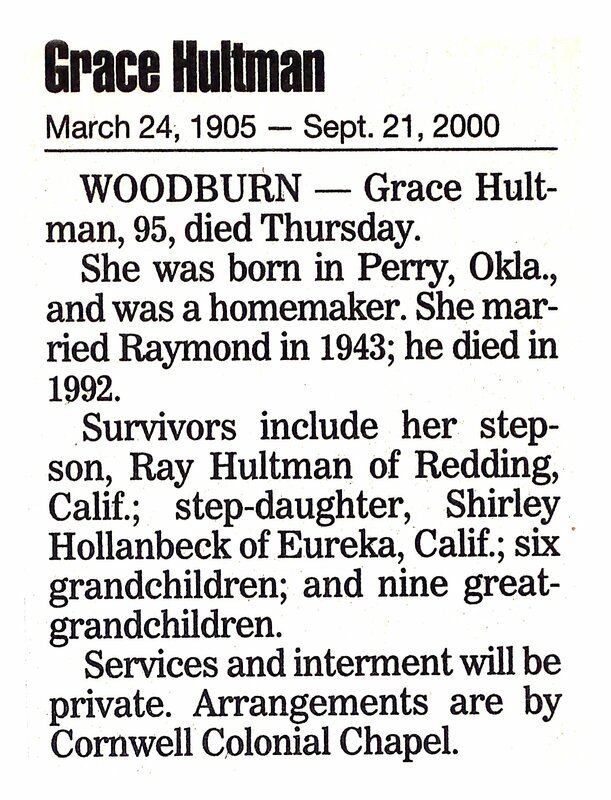 Grace married Raymond Edward HULTMAN 1 in 1943. Raymond was born on 26 May 1901 in WA. He died on 29 Dec 1992 in Woodburn, Marion Co, OR. Raymond resided in 1940 in West Portland, Multnomah Co, OR. He was issued a social security number in 1961 in CA. He resided in 1966 in H2675 Fletcher Pkwy (El Cajon) Apt 320, San Diego, San Diego Co, CA. 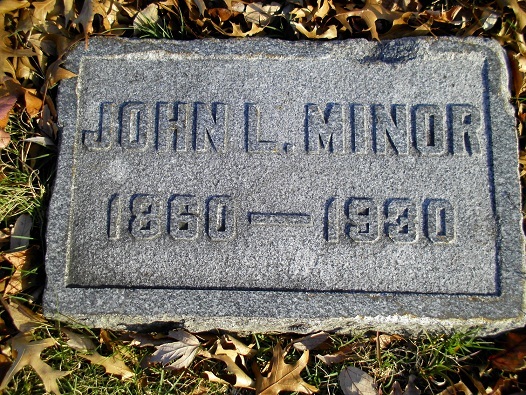 John L MINOR [scrapbook] was born in 1909. He died in 1910. 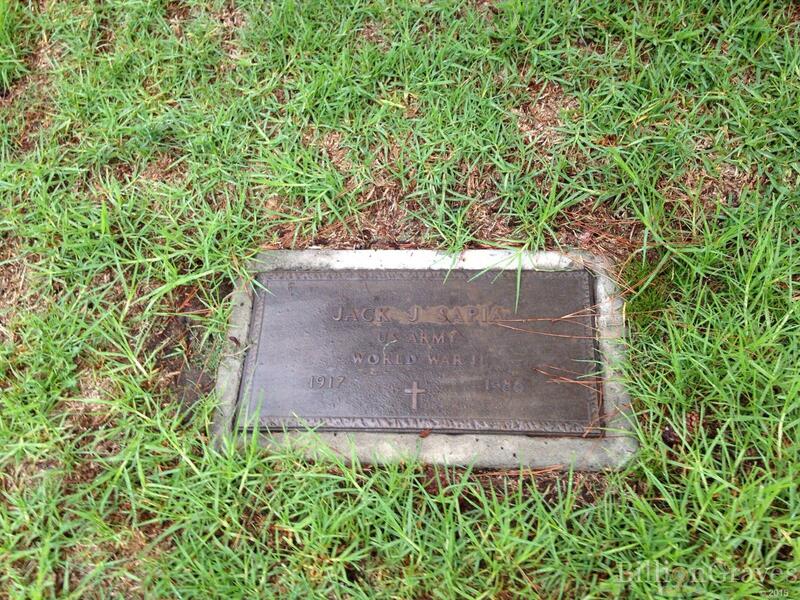 He was buried in GAR Cemetery, Miami, Ottawa Co, OK.
John resided in 1977 in Emporia, KS. 1091. Malinda May BITLER (Sylvester VanTress , Daniel , Daniel , John , Johannes ) was born on 12 Jan 1872 in Kansas. She died on 19 Oct 1942 in Los Angeles, Los Angeles Co, CA. She was buried in Sunrise Slope Map 1 Lot 5955 Space 4, Forest Lawn Memorial Park, Glendale, Los Angeles Co, CA. Malinda resided in 1880 in Madison, Greenwood Co, KS. She worked as At School in 1880. She resided in 1885 in Janesville, Greenwood Co, KS. She resided in 1895 in Agnes City, Lyon Co, KS. She worked as housekeeper in 1895. She resided in 1910 in 1214 Stamford Ave, Los Angeles, Los Angeles Co, CA. She worked as clerk - dry goods in 1910. She resided in 1920 in 1324 Valencia St, Los Angeles, Los Angeles Co, CA. She worked as Dress maker - Private Family in 1920. She resided in 1930 in 1026 N Spalding Ave, Beverly Hills, Los Angeles Co, CA. She resided in 1935 in 1026 N Spalding Ave, Beverly Hills, Los Angeles Co, CA. She resided in 1940 in 1026 N Spalding Ave, Beverly Hills, Los Angeles Co, CA. Malinda married Lefford F MCCORMICK on 7 Oct 1891 in Lyon Co, KS. The marriage ended in divorce. Lefford was born about 1867 in IL. Lefford resided in 1895 in Agnes City, Lyon Co, KS. He worked as harness maker in 1895. Bessie May MCCORMICK was born on 24 Jan 1893 in Lyon Co, KS. She died on 17 Nov 1897 in Lyon Co, KS. Bessie resided in 1895 in Agnes City, Lyon Co, KS. VanTress Bitler "Tressie" MCCORMICK was born on 14 Mar 1897 in Emporia, Lyon Co, KS. He died on 18 Jan 1980 in Orland, Glenn Co, CA. Tressie resided in 1910 in 1214 Stamford Ave, Los Angeles, Los Angeles Co, CA. He served in the military with in WW I. He resided in 1920 in 1324 Valencia St, Los Angeles, Los Angeles Co, CA. He worked as mechanic - electrical motor? in 1920. He resided in 1930 in 529 Manchester Terrace, Inglewood, Los Angeles Co, CA. He worked as Mechanic - Electric Manufacturer in 1930. He resided in 1940 in 8116 Maitland Ave, Los Angeles, Los Angeles Co, CA. He worked as electrical contractor - own office in 1940. He was issued a social security number before 1951 in CA. He resided in 1977 in Oakland, CA. He resided in 1980 in Orland, Glenn Co, CA. Tressie married Gladys Laura BLOXSOM, daughter of Richard Henry BLOXSOM and Birdie Charlotte OWINGS, about 1920. Gladys was born on 27 Nov 1903 in Kansas. She died on 16 Jun 2003 in Orland, Glenn Co, CA. Gladys resided in 1930 in 529 Manchester Terrace, Inglewood, Los Angeles Co, CA. She worked as Seamstress - Dressmaking Shop in 1930. She was issued a social security number before 1951 in CA. Tressie also married Gladys. Gladys was born about 1894 in KS. Gladys resided in 1940 in 8116 Maitland Ave, Los Angeles, Los Angeles Co, CA. She worked as dressmaker - gown shop in 1940. + 3440 F iii Velma M MCCORMICK was born about 1899. Essie E MCCORMICK was born on 29 Oct 1901 in KS. She died on 18 May 1988 in Orange Co, CA. Essie resided in 1910 in 1214 Stamford Ave, Los Angeles, Los Angeles Co, CA. She resided in 1920 in 1324 Valencia St, Los Angeles, Los Angeles Co, CA. She worked as stenographer - lawyers office in 1920. She resided in 1930 in 1026 N Spalding Ave, Beverly Hills, Los Angeles Co, CA. She worked as office clerk - grocery store in 1930. She resided in 1935 in 1026 N Spalding Ave, Beverly Hills, Los Angeles Co, CA. She resided in 1940 in 1026 N Spalding Ave, Beverly Hills, Los Angeles Co, CA. She worked as secretary - attorney's office in 1940. She was issued a social security number . Essie married [Male] in 1930/1940 in Los Angeles Co, CA ?. Vivian Anita MCCORMICK was born on 25 Feb 1905 in CA. She died on 22 Sep 1957 in Los Angeles, Los Angeles Co, CA. Vivian resided in 1910 in 1214 Stamford Ave, Los Angeles, Los Angeles Co, CA. She worked as cashier girl - dry goods in 1910. She resided in 1920 in 1324 Valencia St, Los Angeles, Los Angeles Co, CA. She resided in 1930 in 1026 N Spalding Ave, Beverly Hills, Los Angeles Co, CA. She worked as stenographer - law office in 1930. She resided in 1935 in 1026 N Spalding Ave, Beverly Hills, Los Angeles Co, CA. She resided in 1940 in 1026 N Spalding Ave, Beverly Hills, Los Angeles Co, CA. She worked as office clerk - retail market in 1940. She was issued a social security number . 1092. Jenny Maude BITLER [scrapbook] 1 (Sylvester VanTress , Daniel , Daniel , John , Johannes ) was born on 31 May 1874. She died on 9 May 1929 in Belleville, Republic Co, KS. She was buried on 12 May 1929 in Belleville Cemetery, Belleville, Republic Co, KS. Jenny resided in 1880 in Madison, Greenwood Co, KS. She worked as At School in 1880. She resided in 1885 in Janesville, Greenwood Co, KS. She worked as deputy clerk with Lyon County in Emporia, Lyon Co, KS. She worked as clerk with Rorabaugh's Store in Emporia, Lyon Co, KS. She worked as clerk with G. W. Newman's store in Emporia, Lyon Co, KS. She resided in Oct 1899 in Belleville, Republic Co, KS. She resided in 1900 in Belleville, Republic Co, KS. She resided in 1910 in Belleville, Republic Co, KS. 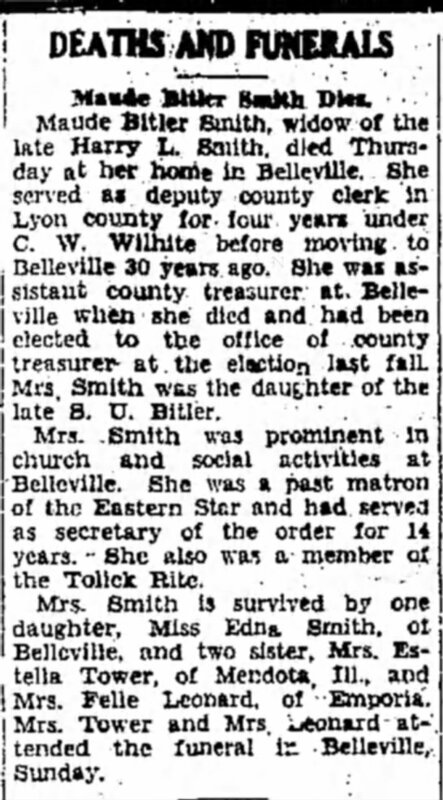 She resided in Sep 1918 in Belleville, Republic Co, KS. She resided in 1920 in Belleville, Republic Co, KS. She worked as assistant county treasurer in 1929 in Republic Co, KS. She was a member of Order of Eastern Star (past matron, secretary). She was a member of Tolick Rite. Jenny married 1 Harry Leland SMITH [scrapbook] 2, son of Alexander SMITH and Mary E YOWLER, about 23 Oct 1899 in Madison, Greenwood Co, KS. Harry was born on 25 Aug 1873 in Guernsey, OH. He died on 2 May 1923. He was buried in Belleville Cemetery, Belleville, Republic Co, KS. Harry worked with harness business until 1897 in Emporia, Lyon Co, KS. He worked as harness maker in 1897 in Belleville, Republic Co, KS. He resided in Oct 1899 in Belleville, Republic Co, KS. He resided in 1900 in Belleville, Republic Co, KS. He resided in 1910 in Belleville, Republic Co, KS. 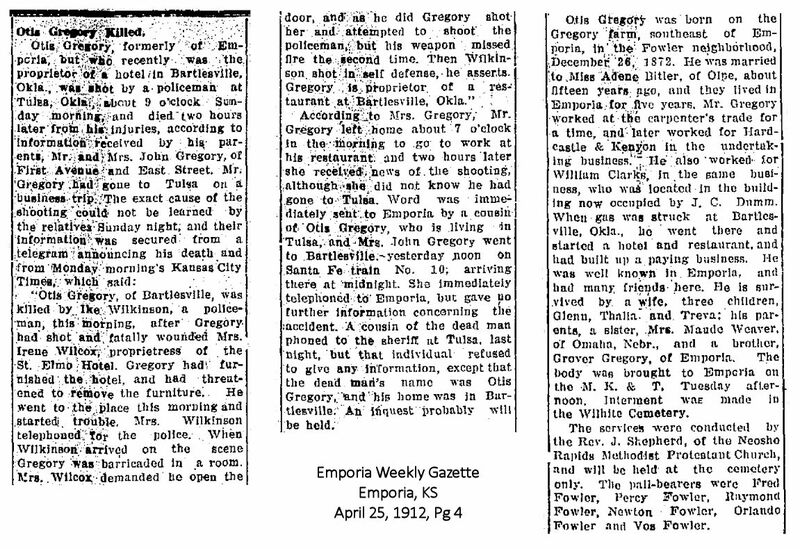 He resided in Sep 1918 in Belleville, Republic Co, KS. He worked as harness maker with G. W. Collins in Sep 1918. He resided in 1920 in Belleville, Republic Co, KS. 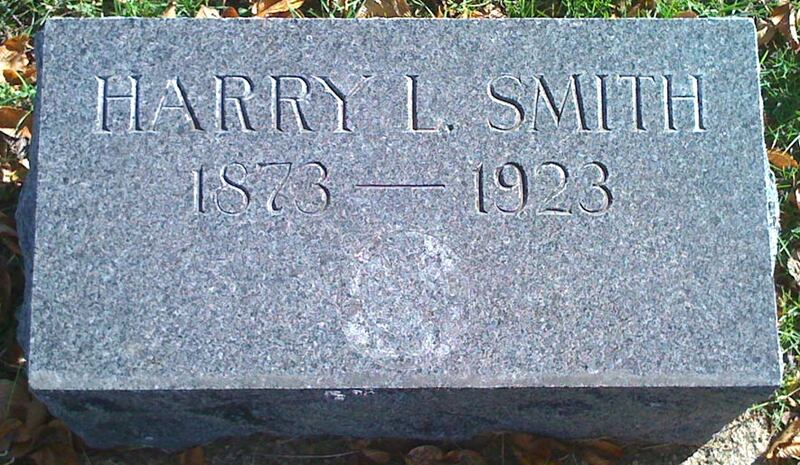 [Male] SMITH was born on 8 Jan 1904 in Belleville, Republic Co, KS. He died on 12 Jan 1904 in Belleville, Republic Co, KS. He was buried in Belleville Cemetery, Belleville, Republic Co, KS. + 3446 F ii Edna M SMITH was born on 19 Oct 1905. She died on 16 Feb 1993. 1093. Mary Adine "Adine" BITLER 1 (Sylvester VanTress , Daniel , Daniel , John , Johannes ) was born on 21 Jun 1876 in KS. She died on 29 Oct 1959. She was buried in Plot 38-18-3, Maplewood Memorial Lawn Cemetery, Emporia, KS. Adine resided in 1880 in Madison, Greenwood Co, KS. She worked as At Home in 1880. She resided in 1885 in Janesville, Greenwood Co, KS. She resided in 1900 in Batesville, Cherokee Nation, Indian Terrotory. She resided in 1910 in 524 Chickasaw Ave, Bartlesville, Washington Co, OK. She resided in 1920 in 529 Chickasaw Ave, Bartlesville, Washington Co, OK. She resided in 1930 in 529 S Chickasaw Ave, Bartlesville, Washington Co, OK. She resided in 1940 in 529 Chickasaw Ave, Bartlesville, Washington Co, OK.
Adine married Otis GREGORY [scrapbook] 1, 2, son of John GREGORY and Ellen, about 1896 in Lyon Co, KS. Otis was born on 26 Dec 1872 in Near Fowler, Lyon Co, KS. He died on 21 Apr 1912 in Tulsa, Tulsa Co, OK. He was buried in Wilhite Cemetery, Emporia, Lyon Co, KS. Otis resided in 1900 in Batesville, Cherokee Nation, Indian Terrotory. He worked as Carpenter in 1900. He resided in 1910 in 524 Chickasaw Ave, Bartlesville, Washington Co, OK. He worked as Fire Man - City Dept in 1910. Glenn A GREGORY was born on 31 Oct 1900 in OK. He died on 8 Dec 1967. He was buried in SW, Dewey Cemetery, Dewey Co, OK.
Glenn resided in 1910 in 524 Chickasaw Ave, Bartlesville, Washington Co, OK. He resided in 1920 in 529 Chickasaw Ave, Bartlesville, Washington Co, OK. He resided in 1930 in 529 S Chickasaw Ave, Bartlesville, Washington Co, OK. He worked as Electrician - Oil Co in 1930. He was issued a social security number before 1951 in OK. He resided in Dec 1967 in Bartlesville, Washington Co, OK.
Glenn married [Female] in 1920/1930 in Washington Co, OK?. The marriage ended in divorce. + 3448 F ii Thalia A GREGORY was born on 9 Jun 1905. She died on 8 Dec 1988. Treva Bettina GREGORY [scrapbook] was born on 14 Mar 1908 in Bartlesville, Washington Co, OK. She died in May 1991 in San Diego Co, CA. She was buried in Eternal Hills Memorial Park, Oceanside, San Diego Co, CA. Treva resided in 1910 in 524 Chickasaw Ave, Bartlesville, Washington Co, OK. She resided in 1920 in 529 Chickasaw Ave, Bartlesville, Washington Co, OK. She resided in 1930 in 529 S Chickasaw Ave, Bartlesville, Washington Co, OK. She worked as Stenogapher - Tank Co in 1930. She resided in 1940 in 2528 E 5th St, San Antonio, Los Angeles Co, CA. She was issued a social security number before 1951 in CA. She resided in May 1991 in Vista, San Diego Co, CA 92083. 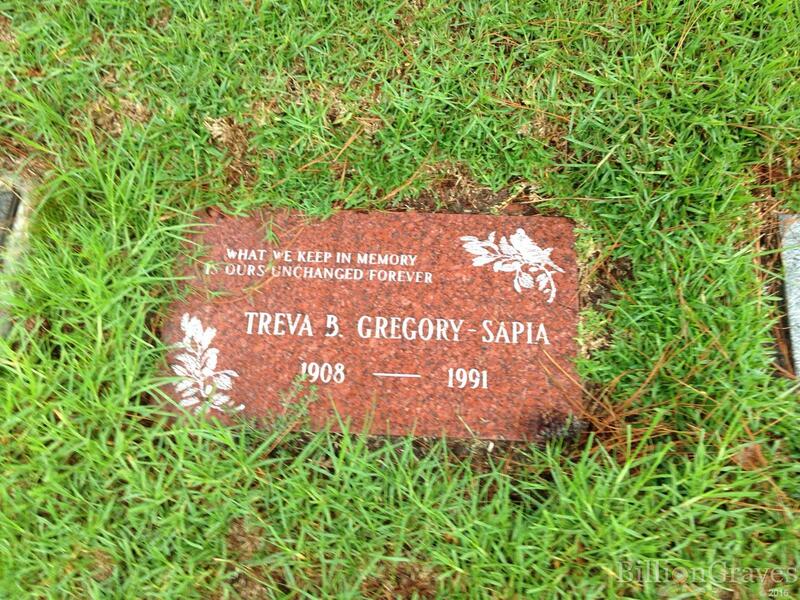 Treva married Jack John SAPIA [scrapbook], son of Ben SAPIA and Mary. Jack was born on 27 Dec 1917 in Fayette City, Fayette Co, PA. He died on 22 Mar 1986 in Vista, San Diego Co, CA. He was buried in Eternal Hills Memorial Park, Oceanside, San Diego Co, CA. Jack resided in 1940 in 67 Loughlin St, Ambridge, Beaver Co, PA. He worked as clerk -steel mill in 1940. He resided in 1942 in PA. He served in the military with U.S. Army on 11 Apr 1942. 3450 F iv Louise C GREGORY. 3451 F v Sybil GREGORY.